AFG is the only association geared towards fundraisers working in associations and association foundations. So, you don’t want to miss AFG’s 2019 National Conference in Washington, DC. All the content is tailored to our niche needs will focus on how you and your fellow association fundraisers can Gain the Edge. *The non- member registration fee includes a free trial AFG membership for new members through June 30, 2019. Your benefits may continue by renewing your membership at that time. Scroll down to register online or download and print the 2019 AFG National Conference Registration form here. Early Bird prices good through March 29th. Tailor your unique conference experience during each of the four breakout time slots with 16 Breakout Sessions to choose from. Download the list of Breakout Sessions and speakers here. Opening Keynote: “AFG: What’s Next?” – Join former AFG President, Barkley Payne (Executive Director, AMA Foundation), as he moderates a town hall meeting during the Opening General Session. It has been five years since AFG published the white paper AFG: The Next 25 Years, a special initiative to identify the unique opportunities and challenges facing association foundations for the next 25 years, with a focus on the next three to five years. It’s time to revisit this report and chart a course for AFG and its members for the next five years. Joining Barkley Payne will be panelist members Natalie Zundel, CFRE, AFG President (Director of Development, ASCRS Foundation), David Coyne, CFRE (President, The Sheridan Group), Katrina Dunn (Director of Development, American Fisheries Society), Stephen Ewell (Executive Director, Consumer Technology Association Foundation), John Graham, CAE (President and CEO, ASAE) and Eileen Murray, CAE (Executive Director, American Epilepsy Society). This keynote is designed to both garner responses from the panel, as well as responses and questions from you! Closing Keynote: Paula Cozzi Goedert returns this year as our closing keynote speaker. A partner at Barnes & Thornburg LLP, where she is the chair of the firm’s Associations and Foundations group. Paula is a perennial favorite at the AFG National Conference, and this year she wants to hear from you. Tell AFG your pain points when it comes to liability, risk, and legalities of running an association foundation, and help Paula tailor her keynote! Free small group coaching sessions help you reach your personal professional goals! These optional sessions will be held following the Closing General Session from 4:45-5:45 pm. Space is limited. A full list of coaches and topics will be released soon! A HUGE THANK YOU to our 2019 AFG Sponsors! 2019 Sponsor Prospectus: Opportunities Available! Registering for multiple attendees? Please complete this form for each attendee separately. Yes, I plan on attending.No, I will not be attending. Is this your first time attending the AFG Convention? How long have you been in association foundations? Who pays for your membership dues? What percentage of your job duties are dedicated to fundraising? The AFG has reserved a room block at the Courtyard Washington DC / Dupont Circle 1900 Connecticut Avenue, NW Washington, DC 20009 - website: www.marriott.com/wasnw Call: 202-332-9300: Be sure to ask for the AFG Room Block: Please note, a direct reservation link to reserve online will be provided in your registration receipt. Refund Policy: No Refunds will be granted. Registration fees are transferrable. Registration credits must be used within one year of date issued. (Applicable to attendee and exhibitor registrations) Payment Policy: The acceptable methods of payment are checks, cashier's checks, money orders or credit card. All payments must be received within 10 days of registering for the AFG Conference. All early bird fees must be paid prior to March 30, 2019, any unpaid registrations will automatically increase to the regular attendee registration fee. Registration fees must be paid prior to May 16th, 2019. Cancellation Policy: All cancellations MUST be submitted in writing (emailed to info@associationfoundationgroup.org). Telephone requests WILL NOT be honored. Paid registration (attendee or exhibitor) fees will be transferred or credited. The registrant will be held responsible for any unpaid registration fees, regardless if they do not attend the conference. All registration transfers must be made in writing by May 1, 2019, to info@associationfoundationgroup.org. 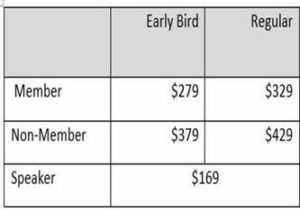 For nonmembers, a refund of the full nonmember conference fee minus the $125 membership fee (included in conference registration) will secure membership in AFG through June 30, 2019, and no administrative fee will be charged. Registrants choosing to forgo membership in AFG, and current members who received conference member pricing will be subject to a $50 administrative refund fee.